Minimalist makeup: Five products. All done. 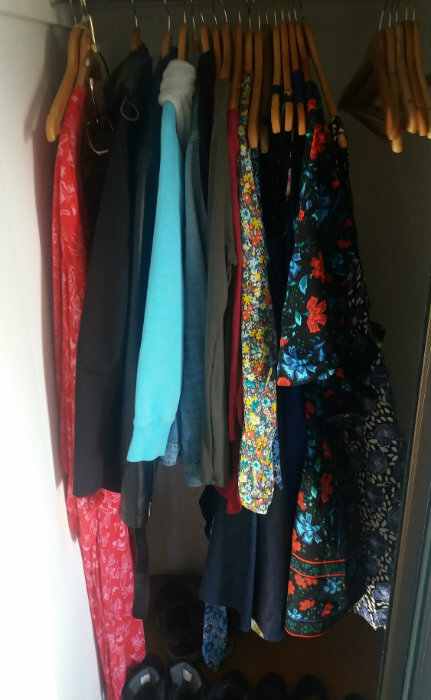 I’ve been doing The Project 333 – a capsule wardrobe programme – for three years now. It has been a huge learning experience, and you can follow my capsuling trials – and errors! – in the “Capsule wardrobe” tabs in the menu of this blog. When I first started The Project, I did as suggested and dragged all the clothes I owned out on to the bedroom floor and counted them. I was stunned to find I owned over 200 items of clothing! Most of it I hadn’t worn in ages, a lot of it didn’t fit me, and some of it even had labels still attached. It was a mess. It reflected my haphazard approach to shopping, my need to self-medicate by buying stuff, and my general dissatisfaction with my body, plus a whole stack of other issues I’ve been dealing with across the years. They say a cluttered home is a reflection of a cluttered mind. A cluttered wardrobe is no exception. These days, now I’m entering my third year doing The Project, my wardrobe is sleek and small, and I wear everything I own. When I make a buying mistake – because I still make buying mistakes – I send them back to the shop or sell them as soon as I can, so they don’t become clutter. But I make far fewer mistakes than I did three years ago. I shop less. I save money. I dress better. Capsuling works. I got rid of about 30 hangers, but I still have too many spare hangers in my wardrobe – you can see them hanging in the wardrobe here. So more decluttering still needs to be done. It’s an ongoing process for most people. It certainly has been for me. 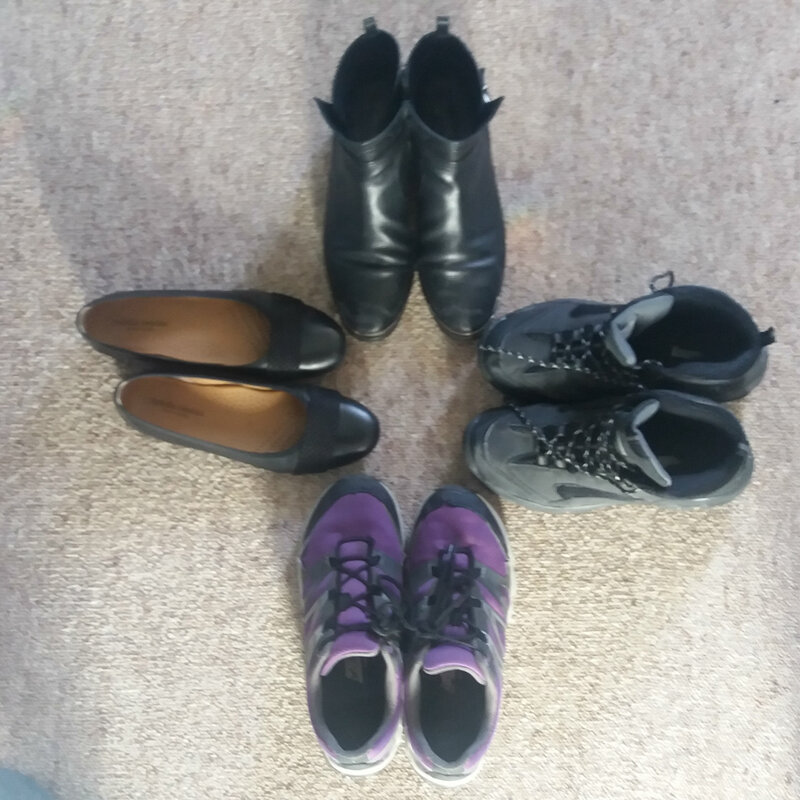 I own four pairs of shoes in my capsule. Probably too many. There’s also a pair of uggs (slippers don’t count) and crocs for gardening (loungewear / gardening wear doesn’t count). Apart from what you see I have one drawer of t-shirts and jeans I own two pair of jeans and four t-shirts), another drawer for my sportswear capsule (I’ll do a second post on sub-capsules), and a drawer for my underwear. Plus some crocs for gardening and a pair of ugg boots for homewear (neither counts in the capsule, according to The Rules of Project 333). Quality counts. Good quality costs more, but it wears better, feels better and last longer. I spend more money on items like jeans, jackets, shoes and belts, and it is worth every cent. Especially with shoes! Fit counts. These days I don’t worry about the size on the label so much. If the size on the label feels too big, I snip it out! 🙂 Instead, I pay attention to how an item fits when I put it on, and especially check leg and sleeve length. If it doesn’t fit properly it is never worth keeping. Life is too short for broken clothes. If you can afford to not wear broken clothes, don’t wear them! Or get them mended. Don’t ever put up with missing buttons, gaping shirts that are too small, stains on shirts, pilled jumpers, shoes that pinch and frayed collars. Don’t look shabby. If money is an issue, you’d be surprised what is available in secondhand shops and charity stores – especially for men. My partner has bought excellent business shirts in as-new condition for very little (NZD$4 each) by buying secondhand. This world is awash in great secondhand clothing in excellent condition – all you have to do is look. Accept the body you have. Here and now. Face reality, and be your best self today. This is a tough one. I’ve spent most of my life being unhappy with my body in one way or another. It’s something a lot of people are familiar with. But I know this: wearing a size that is too small, or hiding in shapeless clothes while waiting for that magical day when you’re suddenly “the right size” is a waste of who you are, here and now. Make peace with your body, and wear clothes that make the best of your real, current physical self. Just because you bought it doesn’t mean you have to keep it. I’ve bought lots of “mistakes” in my life – clothes I liked in the store but when I got them home I didn’t like them or didn’t wear them for some reason. If you can, return them. If not, sell or give them away. Everyone makes mistakes but that doesn’t mean you have to house them in your wardrobe forever! Own a small number of beautiful, good-quality, comfortable items you love to wear. Don’t waste your time with a huge wardrobe of meaningless clothing. Choose wisely and well. These days I spend my money on a mix of beautiful dresses and ultra-comfy clothing for casual wear. Everything fits. I wear – and like – everything I own. I have a very small wardrobe and I agree, rarely anyone notices that I wear the same thing all the time and I have found the ones who do actually notice because they too are trying to reduce their wardrobes or they really like a dress I wear and want it! Yep. The only case I can see for anyone needing a big wardrobe is for people who are in the media’s eye and get strongly criticised if they wear the same thing. For example, I remember a male Aussie newscaster wearing the same suit for a year and nobody commenting or even noticing, yet his female co-host getting huge amounts of criticism for many of the huge number of outfits she wore. The media can be harsh. And a friend of mine who is a TV host finds that she needs a huge number of clothes because what she wears gets noticed and commented on daily. But for the rest of us, we can usually get by on very little.